What happens when artists, activists, and communities transform the invisible issue of lead into a visible creative currency? You get the Fundred Project. Launched in 2008, the Fundred Project and its collection of Fundreds (what’s a Fundred? Read on to find out…) from nearly half a million people has prompted a reckoning with the following question: How much do we value a future free of lead poisoning? Over the past decade the Fundred Project has worked to activate knowledge, build empathetic public will, and demand public funding and action to end lead poisoning, a devastating health and environmental threat disproportionately in low income communities of color. Through the Fundred, a specific artwork that can adapt and catalyze efforts across the country, we brought together artists, educators, policy experts, and elected officials into sustained dialogue about the impact of lead and the value of children and families. Further invigorated by support of the Kresge Foundation, this year MIT CoLab, in partnership with Mel Chin and SOURCE Studio, set out to strike a balance between developing key relationships and scaling for impact, a challenge shared by most creative policy engagement efforts. Below are interviews with Fundred Project team members discussing the Fundred Reserve Open Lab – a temporary community space in Washington DC, Fundred Dollar Hill Day – a day of Hill visits and DC press conference on the 4 year anniversary of the Flint water switch, and the importance of bringing artistic practice and policy work together. The interviews were recorded in Asheville, NC on June 28, 2018 by Liz Lang and are hosted by Fundred Project leaders Amanda Wiles and Pat Clifford. In this segment, Dawne Langford (DC-based filmmaker and Fundred Reserve Open Lab curator and manager) and Elijah Williamson (DC-based designer and Fundred team member) discuss their experience with the Fundred Reserve Open Lab. The Open Lab was a site where the Fundred Project piloted a wide variety of relational approaches, including public narrative training, circling (a process of intentional small-group dialogue used frequently in restorative justice work) and student internships, to create spaces for creativity and dialogue. By securing a physical location where different community members could gather, the team was able to pursue new partnerships and foster new conversations. 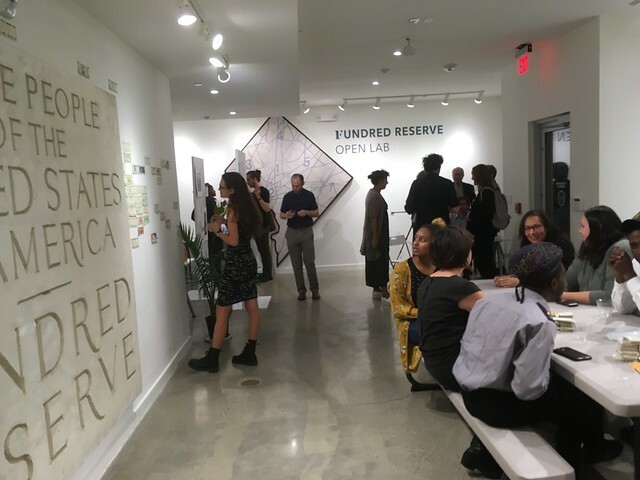 An intentional effort was made to empower Fundred artists as individuals and leaders in organizing and implementing events including the integration of storytelling into our work, community-based research, and public dialogues. In this segment, Siyona Ravi (New York-based cultural worker and Fundred engagement worker) and Audrey Liu (NYC/DC/NC-based Fundred team member) discuss Fundreds All Over New York. This effort provided the Fundred Project an amazing opportunity to hone our Fundred making engagement efforts. The activities incorporated the spirit of Mel Chin’s show All Over the Place and took advantage of the associated projects that happened in New York City during the spring and summer of 2018 throughout the boroughs. In NYC we prioritized partnerships with arts institutions such as the Queens Museum and Brooklyn Children’s Museum, and also developed relationships with New York Public Schools to use Fundreds to elevate the voices of children at risk for lead exposure and environmental justice. Melissa Mays (Flint resident, lead activist and Fundred team member) and Maps Glover (DC-based performance artist and Fundred team member) discuss the connections between artistic practice and policy change. These days–regardless of geography–those working to effect change in any issue area, including healthy housing, can become disoriented by the pace of often-fabricated crisis unfolding at all political levels. Mays and Glover discuss ways that creative and arts-based activities can break through the “noise” of the daily news cycles. While the crises can dwarf the scale of our efforts, our creative witness often has the effect of bringing awareness and hope.